You know that vegetables are an important part of your diet but they can be a bit dull. However, spiral veggies are fun! 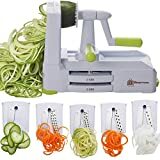 The best spiralizer can help take your everyday, boring salad or vegetable side dish into something fun and nutritious. Spiralized vegetables are a great way to incorporate new vegetables into your diet. For people following specialized diets like paleo or keto, spiralized vegetables offer a great alternative to traditional grain-based noodles. What Makes The Best Spiralizer? Investing in a spiralizer can help you have more fun eating vegetables. But what goes into finding the best spiralizer for your needs? First, to determine what your needs are, understand how spiralizers work. After you have learned that, you will better understand what sets the best spiralizer apart from the rest. Why Do You Need A Spiralizer? Finding ways to have more fun while you are eating is essential, particularly if you are trying to change your diet to incorporate more healthy choices. Vegetables are a great way to pack more nutrition into your diet, but some people may find vegetables off-putting. Ali Maffucci is the author of Inspiralized, a website that features spiralized vegetables. In an interview with food magazine Bon Appetit, Maffucci points out that spiralized vegetables make it look like you are eating more than you are. Sure, you can always slice your zucchini and carrots the same way you always have with a good chef’s knife. But there’s just something about spiralized vegetables that are way more fun. So while a spiralizer is not necessarily a “must have” in the kitchen, it can certainly change your cooking game, particularly if you are trying to eat healthier. 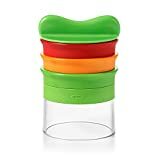 Spiralizers are specialized kitchen tools that spiral cut vegetables by cutting hard or semi-hard vegetable while pushing and spinning it through a stationary blade. Different blades can change the shape of the spiral cut vegetables. Some blades can cut vegetables into thick, individual noodles while others may cut the vegetable into flatter ribbon-like noodles. What Type Of Spiralizers Are There? When choosing the best spiralizer for your needs, consider whether to buy a manual or an electric spiralizer. The vast majority of spiralizers available are manual, which allows you to have more control. Manual spiralizers can come in one of two forms: handheld or countertop. Handheld spiralizers are often tube-shaped, allowing you to place a vegetable into it. You can then turn it with your hand which forces the vegetable out through the blades on the other end. Countertop spiralizers have a platform that allows it to sit stabilized on a countertop. These often work by placing the vegetable onto the cutting platform. You can then use a handle with a crank to force the vegetable through a suspended blade as it turns. Though not as popular as manual spiralizers, there are several electric spiralizers on the market. These may be good to consider if you have any mobility issues or want a faster way to spiralize your vegetables. The majority of electric spiralizers work like the handheld manual models, holding the vegetable upright before feeding it through motor-driven blades that spiralize the vegetable as it passes through. 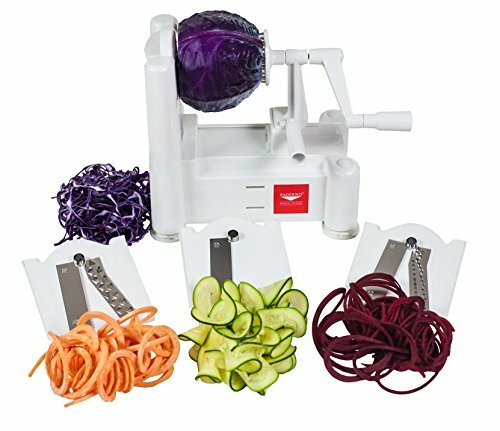 What To look For In A spiralizer? There are several things to consider when finding the best spiralizer to meet your needs. Consider what types of foods you anticipate making with your spiralizer. Are you looking for a spiralizer to make vegetable “noodles”? If so, do you want “noodles” that are flat or more rounded? Do you want a variety to your noodle shapes or are you okay with just one? Are you looking to make spiralized vegetables several times a week or just occasionally? If you only want a small number of spiral vegetables every so often, a handheld spiralizer may be better for you. However, if you are using spiral vegetables in a majority of your meals, you may benefit from a model that can stand up to frequent use. Countertop spiralizers often take up far more room than their handheld counterparts which can often store easily in a drawer. How easy is the cleanup? It is good to consider how easy (or not) the spiralizer is to clean. While all spiralizers can be hand washed, not all are dishwasher safe. Also, some spiralizers require a bottle brush to more effectively clean their small crevices. You can buy a spiralizer readily online as well as at big box stores and specialty kitchen stores. How Much Do Spiralizers Cost? Spiralizers are generally affordable. You can find all types of spiralizers from between $15 to $65 online. Price is usually affected by the number of features as well as the general build quality of the machine. When evaluating the best spiralizer, we chose top-rated spiralizers at various price points. Since manual spiralizers are the most popular, we included a variety of manual spiralizers on our list. After we chose the top spiralizers, we also reviewed what food bloggers and customers had to say about each one. Here is our list of the best spiralizer to meet your needs, presented in no particular order. The Paderno Spiralizer is a manual, countertop spiralizer. The Original 3-Blade design allows you to create thick “noodles,” thin “noodles,” and ribbons. You can find it online on Amazon, Home Depot, and Walmart. This spiralizer earns high praise from professionals. Online food personalities like Downshiftology and magazines like Bon Appetit often include this spiralizer in their recommendations. Kitchen authority America’s Test Kitchen proclaimed the Paderno their winner when evaluating vegetable spiralizers. America’s Test Kitchen found it extremely versatile, able to produce consistent noodles and ribbons of various vegetables with little waste. Among customers, the Paderno spiralizer earns 4.4 out of 5-stars on Amazon with 8,889 reviews. 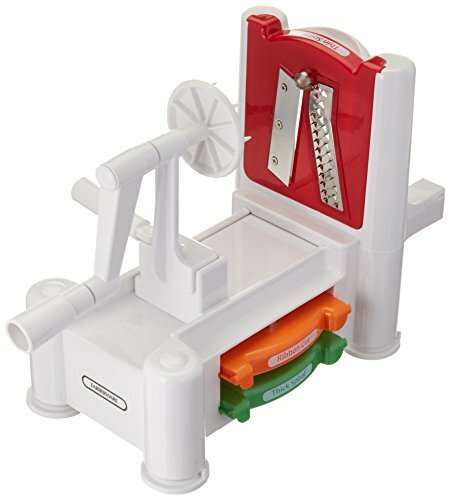 Customers overwhelmingly loved the spiralizer, citing that it worked just as demonstrated on all sorts of vegetables. A one-star, verified buyer review was skeptical of the Paderno spiralizer claims. The reviewer noted that while zucchini spiralized well for them, harder vegetables like carrots and sweet potatoes did not yield desired results. Various critical reviews also mentioned that the suction cups did not work well enough to keep it stable. The OXO Good Grips 3-Blade Handheld Spiralizer is a manual, handheld spiralizer. It comes with three different blades that allow you to make a spaghetti cut, fettuccine cut, and ribbon cut. All the blades store right on the spiralizer, making it easy and compact to store. Reviews do note, however, that the product can be somewhat tricky to clean. In the Question and Answer section, an Amazon customer asked if it was hard to turn since they did not have strong hands. 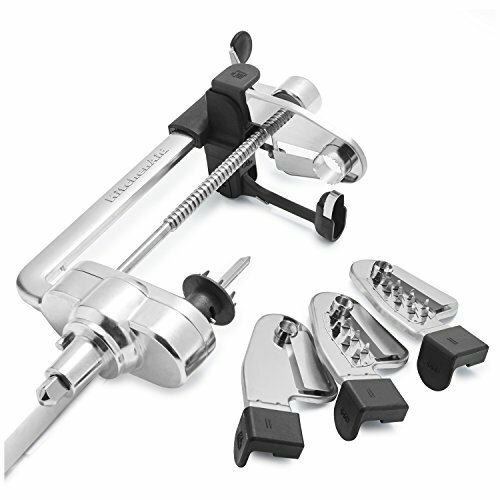 Several customers answered that they would not recommend this spiralizer for anyone with hand problems as it can be difficult to turn and does require some strength. The Farberware Spiraletti is a countertop spiralizer that comes with three, color-coded blades that cut into thick spirals, thin pasta-like noodles, and long ribbon-like strands. You can find the Farberware Spiraletti online at Target, Walmart, and Amazon. This spiralizer earns a 4 out of 5-stars on Amazon with 189 customer reviews. Positive reviews find that the Spiraletti is easy to use with easy cleanup. Quite a few reviews call it a “good value” for the price. Some reviews note that the construction is mostly plastic, with some complaining that the plastic is overly brittle. Several customers indicate that the handle snapped off after just a few uses. The Brieftons Tri-Blade Spiralizer is a countertop spiralizer. It includes three blades that allow you to cut thin, angel-hair pasta-like “noodles,” thicker spaghetti type “noodles” and a flat blade for ribbon cuts. You can find it readily on Amazon as well as various eBay sellers. 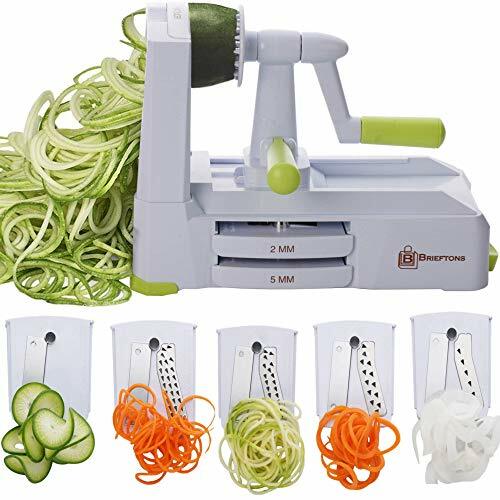 The Brieftons Tri-Blade Spiralizer gets excellent reviews from Amazon customers where it earns 4 out of 5-stars with 3,315 reviews. Fans of this spiralizer overwhelmingly found it to be a good value and easy to use. However, one customer downgraded their initially positive review to a one-star review after the stabilizing handle broke, making the spiralizer unusable. Despite the company’s lifetime guarantee, they were unable to get a replacement. The Kitchenaid Spiralizer Attachment makes quick work of spiralizing vegetables. This all-metal construction, electric spiralizer is an attachment for a Kitchenaid brand standing mixer. It fits all Kitchenaid brand standing mixer models. You can find the Kitchenaid Spiralizer Attachment for between $ and $ online. It is available via online stores such as Amazon, Macy's, and Everything Kitchens. This spiralizer gets excellent reviews online, earning a commendable 4.4 out of 5-stars on Amazon. Amazon customers overwhelmingly loved this spiralizer for its quality and durability. Some critical reviews are disappointed with the weakness of the skewer that holds the fruit or vegetable in place. There are a wide array of spiralizers to choose from, at just about every price point. Our choice for the best spiralizer overall would be the Paderno 3-Blade Spiralizer. Its affordable price point, paired with solid construction and overwhelming recommendations make this an excellent choice for anyone looking to add more spiralized veggies to their diet.